Amazing mentors are at the heart and soul of everything Hebrew Helpers does. Our mentors learn with students by not only preparing them for their individual service, but also giving them, what we hope are, Jewish life skills. Mentors often officiate services and guide families in creating a service that feels truly personal and best encapsulates the process. Perhaps you are only familiar with the mentor with whom you have worked most closely. We would like you to at least have an introduction to all who make Hebrew Helpers the fantastic experience it is! It is our pleasure to present… Leah Buckwold, in our ongoing series Meet The Mentor. I met Leah Buckwold recently on a sunny day in a coffee shop on the Westside of LA where I found the weather matched her disposition. During this interview, I found her to be a passionate educator who cares deeply about connecting with her students and teaching skills like reading Hebrew and trope, all the while inspiring them with her love for Judaism. Q: How did you get involved in Hebrew Helpers? A: I met Todd Shotz (Hebrew Helpers founder) through IKAR (a progressive Jewish community in LA). I’ve basically been a part of IKAR since its inception, and one day there was this adorable guy who was called up during services to read Torah. It was clear to me that we shared the same love of Torah. Afterwards, I went up and introduced myself, and Todd and I became fast friends. Q: Tell me a little more about IKAR, I prompt. A: It really is my happy place. It’s such a warm and welcoming environment; a place where I can truly be myself. I became part of the “davening team,” (prayer leaders) because I gravitated to the front row, and I think the rabbi could see my enthusiasm. A: As a part of the davening team, we bring a strong sense of spirituality and energy to the congregation, which helps elevate the service. Q: When did you officially become a mentor for Hebrew Helpers? A: When Todd began Hebrew Helpers, he asked me if I would like to get involved, and I was very excited to do so. I was the first mentor, other than Todd. Q: That is so cool! Had you ever taught before? A: Yes, I came to Los Angeles in 1996 to attend American Jewish University, and I taught Sunday school at Temple Akiba from my freshman year in college on. I loved it and I felt like my students really appreciated what I brought to the table. In fact, when I left Akiba my students put together a Torah skit and presented me with a lavender booklet. Q: You must have really made an impression on them. But, why a lavender booklet, does it have particular significance? A: I thought you knew, as she points to the lavender sweater I’m wearing. Purple is my favorite color. Everyone who knows me knows this. It’s one of the first things I share with students. I think it helps them feel connected to me when we are getting to know each other. Because people know this about me, I have even received purple-themed gifts from my students. Leah shakes her head and I notice the beautiful earrings hanging from her ears. A: These are from a student. She also gave me a purple kippah and candlesticks, all of which I adore. I think when students are so thoughtful in this way, it speaks volumes about the rapport you create. You clearly connect with them. To what do you attribute this? A: I think it’s simply because I’m doing something I genuinely love. I can’t believe I’m so lucky to do this! Q: Well, that explains why students are drawn to you. You are obviously passionate about what you do, but what makes you so energized about teaching? A: I am really happy when I’m able to surprise a student and they discover the process is actually fun, especially if they were reluctant initially; I am excited when I’m able to pull out a student out of their shell. Q: We’ve been so busy talking about how you got involved in teaching, I haven’t even had a chance to ask you besides your Sunday school teaching, about your background. What is it about your childhood that you think led you to where you are today? A: Before I came to Los Angeles I was living in Salt Lake City, Utah where I was the only Jew in a high school of 2500 students. I was asked questions daily about Judaism. When I think back on that time, in a way I was put in a position to be an educator, because people genuinely wanted to know about my religion. Q: Did you grow up in Salt Lake City? A: No, I was actually born in Canada. My family moved to San Antonio when I was a baby and then to Seattle when I was ten. Then when I was 15 years old, we moved to Utah. Q: You mentioned you went to American Jewish University for college. So, you went from being the only Jewish person in your high school to AJU? That is quite a change. A: It was intentional. At that point, I really wanted to be around other Jewish people. I was so thrilled to come to AJU and be in LA where there is a sizable Jewish population. Q: What else do you think led to you being a mentor today? A: Another influence was my involvement in BBYO during my high school years, which gave me confidence and allowed me to develop my leadership skills in a Jewish context. During my college years, I spent my junior year in Israel. It was the truly one of the best years of my life and definitely formative in my decision to become a Jewish educator. Q: Would you consider making Aliyah? A: I’ve thought about it… a lot. I love Israel so much. The first time I ever went to Israel was on The March of the Living. It’s such an unbelievable experience. First, you go to Poland and march with people from all over the world from Auschwitz to Birkenau. It’s an incredibly moving experience, and then you go on to Israel. When we landed in Israel, I truly understood how special it is and why we need a Jewish state. That was my first trip to Israel, however, in total I have lived there about 4 years: The Conservative Yeshiva, Junior year abroad, Pardes Summer Program and Machon Schechter. As deeply as I feel about Israel, I do love living in Los Angeles. Being an integral part of IKAR, as well as being a mentor for Hebrew Helpers, keeps me here. Q: Speaking of Israel, have you ever officiated at a Bar/Bat Mitzvah in Israel? A: No. I would love to officiate at a Bar/Bat Mitzvah service in Israel, but it just has never worked out that way. I really do look forward to the day when I get to do that, because I think it would be transformative for the student and family alike. However, I also see how intimate and meaningful it is to have a Bar/Bat Mitzvah in your own backyard. 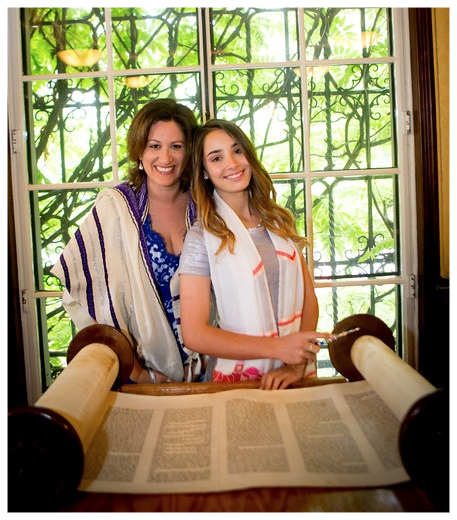 Q: What would you consider to be the most exotic Bar/Bat Mitzvah you have officiated at to date? A: One of my students celebrated her Bat Mitzvah on the beach in Malibu. I think that stands out because it was such a beautiful setting. Honestly though, each Bar/Bat Mitzvah service is meaningful in its own way. I love my students and we really have a good time during the process. One of the things I enjoy so much about being a mentor for Hebrew Helpers is that we really are able to tailor the service to the individual. That is what makes it so remarkable; each and every service we do is unique. 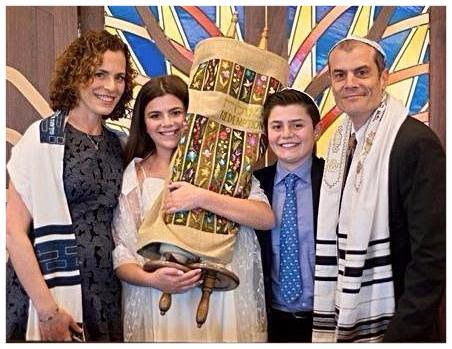 Izzy Hyman holds the Torah at her Bat Mitzvah service with the support of her family around her. 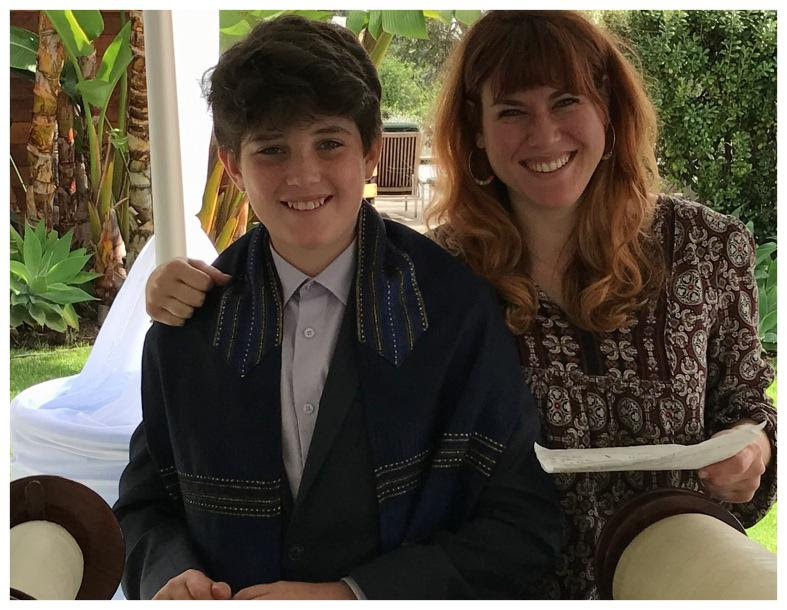 Ted Greenberg smiles confidently as he prepares for his Bar Mitzvah with mentor, Melanie Weinstein. Mazel Tov to our students who celebrated becoming Bar/Bat Mitzvah in February 2017!